Radio Okapi reports that M23 rebels successfully attacked FARDC positions at Rutsiro Ngonkwe Kanombe and Bweza Kisigari early Thursday morning. 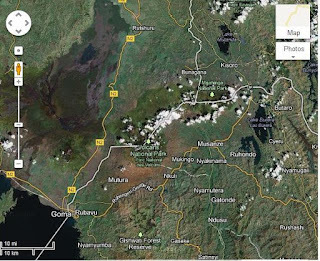 The two encampments were attacked simultaneously from the hills of Runyonyi southeast of Bunagana on the border with Rwanda and are "currently occupied by rebels." Congolese newspapers and opposition figures continue to condemn Rwanda's alleged support for the rebels, with Le Potentiel accusing Kagame of "arrogance" and of continuing with his long-held plan to occupy the Kivus. Le Palmarès observes that Kagame is losing friends both within the region and internationally, as the UN, HRW, and even long-standing allies like the US and England make noises opposing Rwanda's support for the M23. DRC government spokesman Lambert Mende repeated his accusation yesterday that Rwanda is behind the rebel movement, saying: "Il est indéniable que les événements dans le Kivu ont été préparés à partir du territoire du Rwanda." He added that the two countries were on a collision path: "On se dirige vers une rupture de la paix entre notre pays et le Rwanda." Afrikarabia interviews Alphonse Maindo, a political science professor at the University of Kisangani, who recently returned from a research trip to Bukavu et Goma. He says the war in North Kivu is likely to last a long time: "Rwanda is seeking a new strongman in the Kivus," he says, and neither "the Congolese army, nor the UN mission will manage to bring peace." Laura Seay poo-poos the notion--now growing like kudzu among Congolese--that there's some sort of Tutsi conspiracy afoot to annex the Kivus. She points out that the Tutsi are far from united, and that Rwanda long ago abandoned its much-bruited expansion plans. Meanwhile, the usual people are suffering: Relief Web reports that the number of IDPs in DRC passed the 2 million mark in March, for the first time since 2009. The charity MSF provides details. Despite the rising tide of allegations and counter-allegations between Rwanda and Congo, a Center for Intelligence Sharing has opened in Goma; the VOA report is a little vague, but its mission seems to be to coordinate information about militia groups operating in eastern DRC. In non-security related news, the DRC is set to introduce larger denominated franc-notes in the coming week, amid widespread fears that such notes will spur inflation. The fight for the position of spokesperson for the opposition appears to be favoring the UDPS candidate Samy Badibanga over UNC-chief Vital Kamerhe, who apparently failed in his bid to gain the endorsement of MLC boss Jean Pierre Bemba, from his cell in the ICC in The Hague. According to CongoNews, at a speech in Lubumbashi, Kabila party head Evariste Boshab called for the constitution to be amended to allow the president to have a third term. Twenty-one young ladies are competing this weekend for the Miss Congo 2012 competition. The winner will represent the DRC at the Miss World competition to be held in inner Mongolia on August 18. The last time the DRC competed in the Miss World competition was back in 2008. On Saturday, on the outskirts of Kinshasa, an unidentified metallic object fell out of the sky, creating a crater four meters in diameter and about two meters deep. This is apparently the third time such a thing has happened lately.